You cycle III captions are still going strong! Yesterday's submissions were great, and the "Ho Jo To Ho" t-shirt goes to Lisa Stewart for her caption, "Wotan! Instead of whips and spears, many mortal parents are using a punishment called "time-out"..."
Only three more days of caption writing remain! What's going on in this picture? YOU tell us! Leave your creative captions below (and make sure to leave your full name or email address so we can contact you if you win). Toi toi toi! "Maybe they should call her Broomhilde." I said I wanted cash. OK, so I take the gold, and the boulder comes from . . over there. Got it. Don't listen to what HE says; I'M the good-looking one. Hey,we're in Seattle; this thing is from the old Munich Ring. It says, "I'm tough... AND glamourous!" OK, you absolutely have to give this one to the "Obi Wan" comment. Priceless! No one will miss just a tiny piece from this enormous pile -Vahallan retirement plans aren't what they used to be, you know. THIS is the blind date you've set me up with? 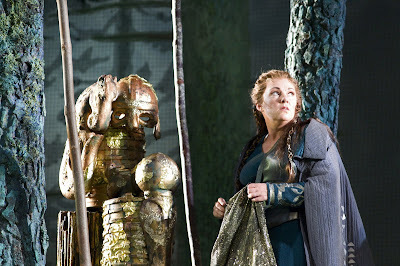 Aaaw c'mon Wotan! Don't you EVER clean? Cockroaches? Fricka, did Wotan raid the fun house at the Valhalla Amusement Park to get this mirror? It makes my bottom look bigger than Fassolt's! What do you mean a "golden hoard," not a "golden horde"? I'm so confused! I was expecting the Chippendales! Since when is there a giant golden grasshopper in this skit?! obi wan has GOT to win! too funny! !